The divisions, conflicts and challenges which humanity faces in the 21st century are at the heart of popular Austrian composer Johannes Maria Staud's grim opera, Die Weiden. The work, which tackles the looming crisis of rising political extremism, was especially commissioned by the Vienna State Opera and will grace its stage this season. In developing Die Weiden (German for "The Meadows"), Staud joins forces with librettist Durs Grünbein to paint a picture of a Europe where right-wing tendencies have taken hold once more and driven a wedge into the heart of the once-united continent. The stark political messages of Die Weiden unfold alongside the love story of Peter and Lea: she is the daughter of migrants who ran away from the Land by the River, while Peter is a proud native there. Their chance meeting results in burning love, which makes Lea go against her family's will and take a journey back to the Land with her paramour. As the pair sail down the River, the audience is treated to the harsh realities of a European continent torn apart by political division, bigotry and hatred yet again. What awaits Peter and Lea at the end of their journey? Johannes Maria Straud is one of Austria's rising stars and a modern classical composer to be reckoned with. Like many of opera's greatest luminaries, he anchors his stage productions in the here and now, unashamedly tackling the thorny subjects of the day. Die Weiden is no exception. Staud and Grünbein take their cues from contemporary politics and society and apply their artistic vision and creativity to push them to the forefront. At times exaggerated or subdued, the end result is well understood "and it must hurt", as the composer himself asserts. In terms of execution, Die Weiden offers a unique amalgamation between Durs Grünbein's expressive lyrical conciseness and Johannes Maria Staud's neo-classical sensibilities. The traditional orchestra, choir and soloists perform alongside electronic loops and sequences, which are one more reminder of the Austrian composer's keen interest in the present. 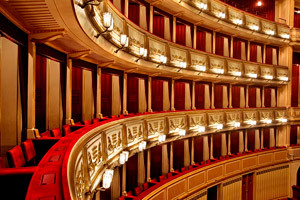 Die Weiden is Staud's third opera and the first of a long-term commitment he has made to the Wiener Staatsoper. Its charged political message and the composer's inimitable style are sure to impress!